Used by several patio door manufacturers. Screw slots allow for vertical adjustments. 7/32"W x 1-3/16"H (not including strike hook). Includes 2 diecast strikes and installation screws. 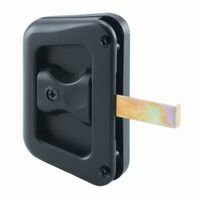 Prime-Line Door Latch Strike, Sliding Screen, Suitable For Use With: Columbia Doors, 9/16 in Projection, Surface Mount, Steel, Zinc Plated, Silver, 1-1/2 in Length X 1/2 in Width, Includes: Hardware, ADA Complaint, For Indoor/Outdoor Applications Plastic roller with narrow center groove 7/32"W nylon wheel, concave edge. 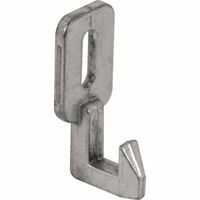 Includes a 8-32 x 3/8" machine screw with binder post nut. Fits on Air Control doors. Used by Metal Industries. Center grooved, 1/4"W, roller. 1-3/4"L, high-tension, heat-treated steel spring. Includes No.8 x 3/8" Phillips sheet metal screw. 1/4"W center groove nylon wheel, high tension 2-1/2"L heat-treated steel spring, and No.8 x 3/8" Phillips pan head sheet metal screw. Non-handed, surface mount, economy pulls, plastic assembly. Contents: 1 black inside pull, 1 black outside pull, #4 8x3/8" Phillips flat head sheet metal screws. 1-7/8"W x 4"H.
For most sliding screen doors. Contents: 1 steel strike, 1 die cast strike, 2 top guides, 2 adjustment screw bushings, and 2 adjustment screws. 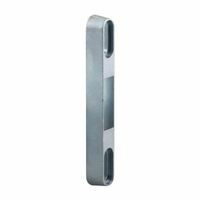 Prime-Line Sliding Glass Door Keeper, 2-15/16 in Length, 1-3/4 in Hole Center to Center, Aluminum, Die Cast Zinc Center grooved nylon. 9/32" width, concave edge. Contents: 2 rollers. Used on Croft and Keller sliding screen doors. 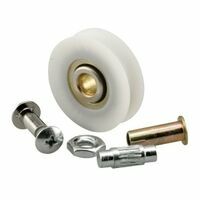 1/4"W x 3/8"Dia flat nylon ball bearing wheel with 3/8" threaded hex hub. Includes 2 rollers and 2 fasteners. 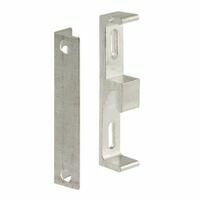 Prime-Line Door Latch Strike, Adjustable, Heavy Duty, Suitable For Use With: Sliding Screen Doors, 1-7/16 in Height X 5/8 in Width, Die Cast, Zinc Plated, Gray, 3/4 in Hook Projection, Surface Mount Consists of 1/4"W center groove wheel, Heat treated, high tension adjustable steel M-spring. Used by several patio door manufacturers. Used by several patio door manufacturers. Consists of 1/4"W center groove wheel, high-tension heat-treated steel v-spring (2"L before and 2"L after bend). 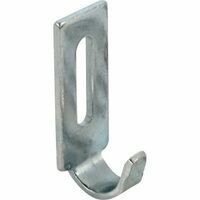 Prime-Line Door Latch and Pull, Sliding Screen, 1-7/16 in Projection, 3-13/16 in Overall Length, 2-1/2 in Overall Width, Suitable For Use With: Hat Section Doors, Plastic, Black, Includes: Hardware Used by Air Control, Howmet, Krestmark and many other patio door manufacturers. Steel ball bearing roller and adjustable 2-5/8"L x 1-3/8"H x 3/4"D steel housing assembly with machine threaded holes (10-32 top and 1/4-20 side) for installation. Used as top and bottom roller by several patio door manufacturers. 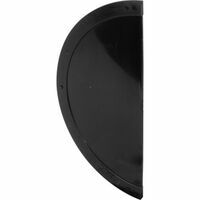 Consists of 1/4"W center groove nylon wheel, 2"L x 3/8"W steel housing, high-tension heat-treated steel spring. Plastic center grooved wheel with steel housing, high-tension steel spring. Fits on Columbia Uni-fit doors. Contents: 2 roller assemblies. Steel ball bearing roller and adjustable 2-3/8"L x 1-1/4"H x 11/16"D steel housing assembly with machine threaded holes (10-32 top and 1/4-20 side) for installation. Fits on Blomberg and other patio door manufactures. Used as top and bottom roller. Plastic wheel with center groove. 1-7/8"L housing, heat treated, high tension steel spring, and No.8-32 x 1-1/4" Phillips pan head screw. Non-handed; black plastic inside and outside pulls; steel latch hook; steel keeper; vinyl top guides; for 1/2" thick Columbia Series 4000 screen doors. Consists of 1/4"W center groove wheel, Heat treated, high tension adjustable steel M-spring. Used by several patio door manufacturers. Prime-Line Sliding Screen Door Shield, Non-Handed, Suitable For Use With: Sliding Screen Door Handle Assemblies, 7 in Length x 3-1/2 in Width, Plastic, Black, For Protecting Area Around Screen Door Handle Prime-Line Sliding Door Keeper, Suitable For Use With: Vinyl-Styled Sliding Glass Doors, Die Cast, Zinc Plated, 4-1/4 in Length X 15/32 in Width, Includes: Fasteners, 3/8 in Hole Center to Center, For Indoor/Outdoor Applications Extruded aluminum housing, with steel spring; adjustable wheel with center groove. Fits on International series No. 900, 925, 950 doors. Contents: 2 roller assemblies; installation screws. Universal design; 1-1/4" nylon ball bearing roller; steel inner race with 1/4" hole; center grooved. Roller Edge Type: Concave. Contents: 2 rollers; 2 bolts. 2-3/4" x 3-5/16" insert with adjustment screw. For 45? miter cut door design. Fits B-515 style rollers; used by many door manufacturers. Non-handed; mortise installation; fits on Academy, Better-Bilt and other door manufacturers. 2" wide and 3" between screw holes. Contents: 1 plastic inside and outside pull; 1 steel latch assembly; 1 diecast strike; installation screws.